What’s the configuration of commercial concrete batching plants? 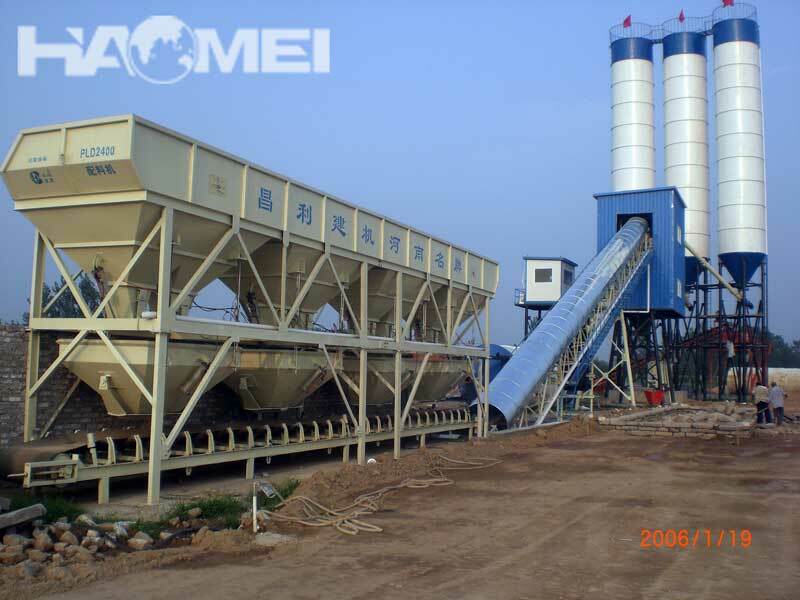 commercial concrete batching plant is widely used to produce commercial concrete, so people like to call it commercial concrete plant. It is a full set of concrete mixing equipments, including the following parts: concrete mixing system, aggregate batching and weighing system, cement weighing system, water weighing system, additive weighing system (optional), cement silo, screw conveyor, full automatic control system, etc. HZS series commercial concrete batching plant, as the name suggests, are ideal equipments to produce commercial concrete, no matter to produce plastic concrete or to produce dry hard concrete, etc. We offer concrete batching plants with various sizes,Such as HZS35-35m³/h HZS60-60m³/h ,HZS90-90m³/h HZS120-120m³/h,HZS180-180m³/h commercial concrete batching plant.Contact us for more information! Mixer consoles with the German technology. Strong mixing performance, mix homogeneous and rapid, high productivity. For dry, rigid, plastic and all kinds of concrete proportion of all can reach the good mixing effect. Mixer scale boards and vanes use special processing, unique shaft-end support and sealing form greatly improves the service life of the mixer. All electrical components of the control system are imported components, greatly reduce the equipment failure. Adopt computer and meter control mode, fast calculation speed, short response time; Cooperate with the patented technology of clicking point filling and automatic buckle says function, make measurement accuracy achieves dynamic and more than national measurement standards. Beautiful and easy modeling, reasonable structure, pleasant color, comfortable operation, maintain convenient, strict logical thinking, profound design concept, thorough ergonomics processing and delicate details of the design is the guarantee of excellent products. The overall structure for module type. Batching machine, belt conveyor, main structure, screw conveyor are independent institutions, the main structure of plant is made up of several independent modules, also remove, installation quickly and transportation is convenient, fast. The machine adopts computer control, can be automatically control, also manual operation, simple operation, easy master. Dynamic panels show, clear understanding of components operation, and can be stored, printed statements material at same time. Each maintenance, repair parts have walk plate form or ladder, directly vision and adequate operation space. Mixer has artificial pump cleaning and manual cleaning, and can work at same time. Plant is fully or semi enclosed equipment, guarantee all assignments can avoid rain or shine. All of the powder material, from feeding, ingredients, measuring, discharging is in sealed state. Fully closed structure of mixing structure and aggregate belt conveyor, greatly reduce the dust and the noise pollution of the environment, according to your needs, set power house centralized deducting system, sand, waste water reclaim system, truly zero emissions and no pollution. According to user’s request, can put some TV monitor (usually four points), to batching machine, concrete mixer and discharging mouth to make real-time monitoring. HZS series commercial concrete batching plant is widely used for water conservancy, electric power, railroad, road, tunnel, the arch of bridge, harbor-wharf and the national defense-project etc. RE: What’s the configuration of commercial concrete batching plants? The models of commercial concrete mixing plants comprise HZS60, HZS90, HZS180 and HZS240. Some projects need double plants of the same model to guarantee productivity. Main components of the plants are raw material storage device, mixing device, distributing device, control device, raw material conveying device and concrete conveying device. Raw material storage device refers to cement silos, since aggregates are usually stored outdoors. Clients can choose the number and model of silos to match their requirements. Generally the models include 50T, 80T, 100T, 200T and 300T. Supporting mixers are usually forced concrete mixers of twin horizontal shafts, like JS1000, JS1500, JS2000, JS3000 and JS4000 concrete mixers. Screw conveyors and belt conveyors serves as conveying device respectively for cement and aggregates, and concrete mixer trucks for finished concrete. A commercial concrete mixing plant is an integrated unit used to mix aggregates, powder and liquid materials into concrete. It’s also called a concrete ready mix plant. Boasting advanced mechanization and automation, it produces good quality concrete with high productivity and low material waste. Its serving targets include middle and large scale water conservation projects, electronic power projects, bridging projects etc, which are featured by big work quantities and long work periods.